The integrated Social Development Centre (ISODEC) has stated that though water is part of the Millennium Development Goal (MDG) targets, 50 percent of Ghana’s population lacks access to safe water. According to the policy think-tank, access to potable water which has been described by the United Nations (UN) as a human right has rather become a scarce annuity in some parts of the rural areas. Leonard Shang- Quartey, Policy Analyst at ISODEC, said government together with civil society organisations (CSOs) needed to work towards delivering potable water to rural areas as a measure to help Ghana achieve the that aspect of MDGs. Mr Shang- Quartey was speaking at the maiden edition of the Water Citizens National Forum, in collaboration with COSPE and the Water Citizens Network. He said government had centered its concentration on providing access to potable water to urban areas to the detriment rural areas. In Ghana, people still use water from unsafe sources and the activities of small-scale mining known as ‘galamsey’ continue to pollute water bodies in rural areas, making water scarce. The policy analyst disclosed that one of the major obstacles to the principles of delivering potable water to rural areas was the activity of water grabbing that led to countries and individuals scrambling to control the management of water resources. He added that water could not be considered as a commodity, particularly in Africa since the human body contained over 70 percent of water. Bishop Akolgo, Executive Director of ISODEC, said without a clear strategy, CSOs would not be able to win the debate on water as human right and not just a commodity. 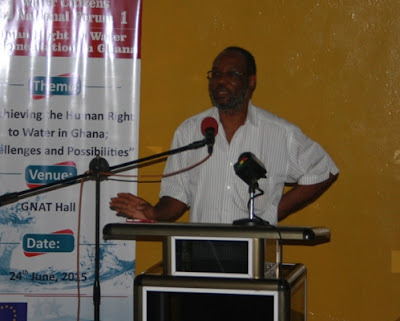 He called on stakeholders to find avenues to clearly define water as a human right and not a commodity. The forum brought together CSOs and members of various communities affected by water pollution.